Our writing prompt this month is WATER. April, on the Canadian prairies where I grew up, was a month of water. The precipitation that came down as snow all winter gradually melted in the warm sun of April’s lengthening days and filled the days with spring’s background music of drip, trickle, and croaking frogs. Judging from all the snow I’ve seen in photos of Saskatchewan recently, this year those songs will have many stanzas. Water is a main feature in the Bible too. One of the first stories in Genesis is a story of water (Genesis 7). Several Bible characters found their spouses at wells (Genesis 24; Genesis 29; Exodus 2:16-21). Jesus had a lot to do with water. He was baptized in water and His first miracle was turning water into wine, He helped His disciples fish, calmed a storm on the Sea of Galilee, and near the end of His life washed His disciples’ feet. 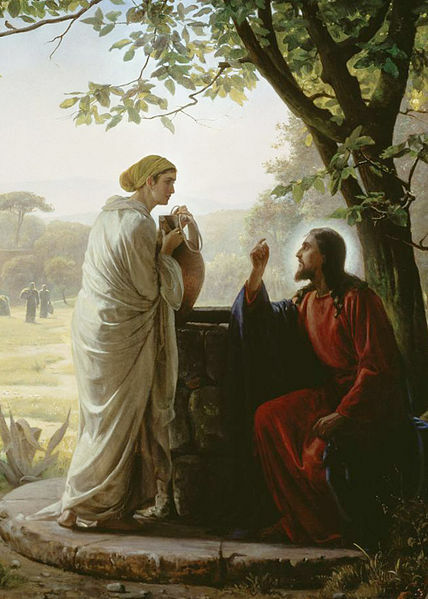 In His teaching He used water as a metaphor for spiritual satisfaction when He talked to the woman at the Samaritan well (John 4:1-26), and invited all the thirsty to come to Him for living water (John 7:37-39). Water is also a prominent feature in dreams (e.g. Joseph and Pharaoh’s dream – Exodus 41) visions (Ezekiel’s vision of the river in the temple – Ezekiel 47:1-12 ) and prophecies (the crystal river in the New Jerusalem – Revelation 22:1-2). Write a story where water is an important part of the setting. Work one of your memories or a characteristic of water into a devotional. Write a how-to piece that involves water. Write about any aspect of water and layer into your poem the metaphorical or spiritual meaning of water suggested by your subject. The poetry journal Time of Singing is running a spring contest on the theme of “Wind and Water.” You might want to submit your March poem on wind, or your April poem on water. Contest entries must be postmarked May 15, 2013. Details of how to enter HERE.